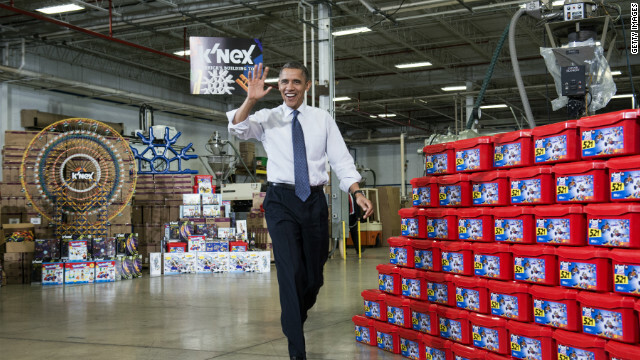 "I've been keeping my own naughty and nice list for Washington," the president said after a tour of the The Rodon Group manufacturing facility, which produces more than 95% of the parts for K'NEX Brands toys. "So you should keep your eye on who gets K'NEX this year. There are going to be some members of Congress who get them and some who don't." The event, intended to mobilize support for the president's proposed solutions to the fiscal cliff, comes as Republicans on Capitol Hill insist that recent negotiations with the White House have been unproductive. Earlier Friday morning, House Majority Whip Kevin McCarthy released a video featuring a small business in nearby Collegeville, Pennsylvania, whose owner, Jerry Gorski, opposes the tax increases being pushed by Obama and Democrats on Capitol Hill. They propose raising rates on families making more than $250,000 in addition to closing loopholes, limiting deductions and increasing taxes on capital gains and dividends. Republicans, however, staunchly oppose a raise in tax rates. But the president remained undeterred in his speech Friday, telling the crowd, "Our long term goal is to get our long term deficit under control in a way that is balanced and is fair. That would be good for businesses, for our economy, for future generations. And I believe both parties can and will work together in the coming weeks to get that done." In recent days Republicans have expressed dismay over the $1.6 trillion in revenue the president has put forward as part of a possible agreement - a higher amount they say they expected. While Obama did not mention any specifics Friday, he did hint that the deal would not be easily agreed upon, saying "In Washington nothing is easy so there is going to be some prolonged negotiations. And all of us are going to have to get out of our comfort zones to make that happen." And just in case those attending the event missed the subtle holiday-themed deadline of the fiscal negotiations, the president was happy to remind them, saying "If Congress does nothing, every family in America will see their income taxes automatically go up on January first…That's a Scrooge Christmas." You forget almost half of America voted against Obama. Plaintiffs' attorneys Lin Wood and Marlan Wilbanks, who claim DaVita made as much as $800 million over-billing the government, say that DaVita's defense won't hold up in court. If Corporations are people , then DaVita's executives should do some time and pay back the tax payers ! Further proof that negotiating is not Obama's forte. Its time to stop campaigning and get serious. Yes Obama won the election, but so did the Republicans who won control of the House. Both the president and the congressmen need to compromise. Let's hope they get serious soon. I would love to see some of the educational credentials that these people in Congress have. This is absolutely ridiculous!!! I would hardly say that the "American People" have spoken. Half the populous disagree with Mr. Obama and the other half agree. I just wish that we can all come to a common ground. Stop blaming each other and come to a solution. We are not going to get what we want all the time. This can neither be blamed on the republicans nor the democrats. We are all in this together. Stop the petty insults online and take some real pride in debate. Mudslinging is unnecessary and distracting. I am tired of looking on cnn, MSNBC, fox news and other outlets to just see rediculous arguments about feelings and hunches. Give us some real news not just "thoughts and insights". I want facts and analysis not bias. I am neither Democrat nor republican. I am the middle. I am a student. I am hopeful that the level headed will keep this country on a stable path. Until all of you stop your hate of Half of the population of America, we have no hope for the future. This election has totaly split this nation, and by what i read online every day, its going to get only worse. I find it curious that Barry kept referring to the Bush tax cuts as being for the rich. Now, he wants to keep them in place for all but the top earners. That this contradiction is not noted by the press and the public shows the dumbing down of this country. For all of you who voted for Obama, it's also exemplary of his disdain for you. I hope you enjoy the next 4 years, tools. Sadly, the rest of us will have to suffer with you. Yes, his naughty list consists of those he wants to send a drone over. Let Obama lead, it's time for stingy millioners to Pony up a little bit more, we middle income people can't bear the weight any more. Netanyahu: 'We will continue to build Israeli settlements' in occupied territory. The same Netanyahu who supported Apartheid in South Africa till 1993s . I am a 1 truck owner-operator and a centrist independent. If itemized deductions were to be capped at $40 or $50 thousand, as some republicans are suggesting, I would be bankrupt. I depend on those deductions to bring my taxes more in line with my actual net income. My single largest deduction is the fuel I burn, about $90 thousand a year. my truck only grosses around $135,000. I am not in the upper 2 or 3 percent income level. I am a working stiff trying to squeak by on about $40 thousand a year net. My wife and I still have a mortgage payment, car payment, groceries, gasoline and utilities ...just like so many others. I am a small business owner who wants to grow his business, however, the republicans are threatening my businesses very existence.